NOVEMBER 2012 VOICE: Our Association played a leading role in the passage into law of the following legislation during the 2011-2012 Legislative Session. Each proposal had been filed as part of the Association's Legislative Package to begin the session. NOVEMBER 2012 VOICE: Buoyed by a strong market surge, the Commonwealth’s $50 billion Pension Reserves Investment Trust (PRIT) Fund increased in value by 8.27% for the first eight months of this year. This is in contrast to our headline earlier this year, which reported that Year 2011 had been a dismal year with zero earnings, and a closing value of $47.1 billion. NOVEMBER 2012 VOICE: At long last the twelve-member Special Commission on Accidental Disability held its initial meeting this September at the State House. 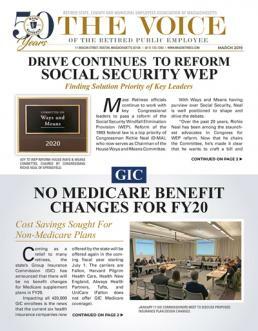 NOVEMBER 2012 VOICE: After more than a decade of starts and stops in the effort to repeal both the Social Security Windfall Elimination Provision (WEP) and the Government Pension Offset (GPO), Association members impacted by one or both of the laws have grown understandably frustrated.